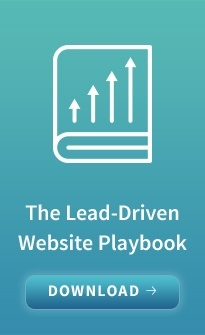 Most B2B websites still follow this program, but smart businesses have realized that great content has lasting value when used purposefully. Content used to be “what you put into your pages,” and appeared in the website creation process only after the IA and design were completed. Today, with the benefit of advanced SEO and analytics, you have clear evidence that the content of your website is critical for attracting the right visitors and nurturing them along a path toward engaging with you. Content creation has moved up the food chain to assume a critical, early role in the web creation process. 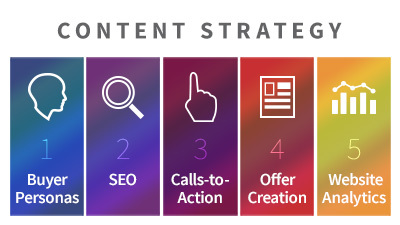 A content strategy begins in lock step with the IA for a new website. Starting at the page level, we determine; What is the goal of each and every page? What would we like the visitor to do on each page?, i.e., Register for an offer like a white paper, webinar or event? Link to another page to learn more? Read a relevant blogpost? Watch a compelling video? Pick up the phone and call? In essence, every page is a home page in that you want to direct your visitor to take some kind of action. All of this purposeful, marketing-focused, page content is then regularly measured through Google Analytics, or other tools for measuring the long-term effectiveness of marketing programs, such as HubSpot, Marketo or Pardot. The analytics then inform what content is generating interest and what is falling flat, which guides future decisions about what types of content needs to be created or embellished upon, what can be repurposed to other outlets like social media, blogs, etc., and what should be retired. Yes, creating a content strategy has made the website process more complex and continuous in nature, but the value of your website will increase exponentially if you do! And you can be sure it's what your competition is doing.